Red-headed Mexican star Saul “Canelo” Alvarez (45-1-1, 32 KOs) got one of his better victories of his career tonight in defeating a guy that was totally made for him in 31-year-old James Kirkland (32-2, 28 KOs) by a 3rd round stoppage on HBO World Championship Boxing at the Minute Maid Park in Houston, Texas. Kirkland, who was fighting for the first time in two years after dropping a lot of fat in training camp, was really no match for Canelo. Kirkland attempted to use his wide open fighting style by plodding straight at the 24-year-old Canelo in the brief three rounds of action and the results were predictable. Canelo dropped Kirkland three times in the fight. Two of the knockdowns came in the 3rd round by right hands from Canelo. The young Mexican star’s first knockdown of the 3rd round came by a right uppercut to the head. Moments later, Canelo finished Kirkland off with a straight right to the head that put him down on his back on the canvas. Kirkland was far too hurt to get up from the knockdown, and the fight was immediately halted at 2:19 of the round by referee Jon Schorle. Kirkland did have his moments in the 2nd round when he appeared to hurt Canelo with a hard left hand to the head that sent the red-haired fighter to the ropes where he spent most of the round covering up. Canelo also appeared to be gassed from having thrown so many punches in the 1st round. Kirkland barely escaped that round as he was getting flurried on as the round ended. It wasn’t surprising that Canelo was able to knockout Kirkland. We’re talking about a fighter who had been previously knocked out in one round by the light hitting Japanese fighter Nobuhiro Ishida in 2011. Kirkland was without his trainer Ann Wolfe, who he’s never lost a fight while training with, and he hadn’t fought in ages. It was great match-making in selecting Kirkland as Canelo’s opponent, but the win really didn’t prove much due to Kirkland’s inactivity and weight gain during his two years out of the ring. For Canelo to prove something, he’s going to bite the bullet and face Gennady Golovkin or Miguel Cotto. There are a handful of very good junior middleweights in the division that would give Canelo a lot of problems in Demetrius Andrade, Jermall Charlo, Jermell Charlo and Joshua Clottey. You would have to rate all of those fighters as well above Kirkland in terms of talent and ability. Kirkland was a good prospect years ago, but he’s not done anything with his career since 2009 when he went to prison for a weapons violation. At the post-fight press conference, Canelo said he would fight Golovkin in the future. It is unclear what Canelo meant by saying that, but it’s possible that we could see Canelo take the fight with Golovkin in 2 to 3 years. Golovkin is 33, so it makes sense for Canelo to wait as long as possible before he makes that fight. If he faces Golovkin now, it would probably be a massacre with Golovkin destroying Canelo because the difference in talent between Golovkin and Canelo is very similar to the difference in talent between Canelo and Kirkland in my view. Next boxing news: Zhanat Zhakiyanov With Another KO Win! 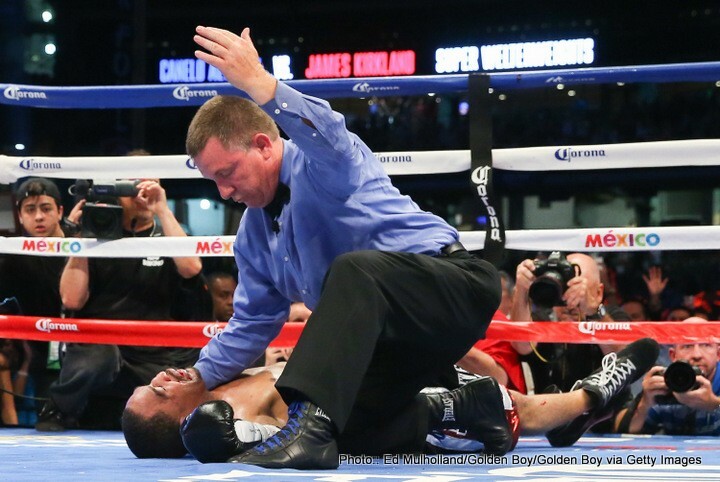 You are here: Home / Boxing News / Canelo Alvarez obliterates Kirkland!